The Wall Street Journal earlier this month published a four-minute interactive video to explain changes to the US healthcare system under the Affordable Care Act, otherwise known as Obamacare. Told from a first-person perspective with a headcam providing a point-of-view (POV) shot, the video allows users to click and explore different aspects of the story, such as related graphics, articles and videos. The video (which is embedded below) starts with someone waking up on the morning of 1 January 2014, the day the changes are due to take effect. It then tells the story through the lives of different individuals. The viewer becomes a cashier, a cycle courier, and an office worker, and the film explains how the law will affect each person. Journalism.co.uk spoke to Neal Mann, multimedia innovations editor at the WSJ, and Jarrard Cole, a multimedia producer, about why they decided to take this approach in interactive storytelling. "A few months ago we talked about the potential for doing a healthcare video, an explainer for our audience on how the changes would affect them when they roll out at the start of next year," Mann explained. "A few things things went through our heads but one thing that really stuck was that we could do this from a first-person perspective. The healthcare roll out is all about how the law affects you, and that's the story we wanted to tell." Mann's view is that "traditional TV-style methods" do not always act as good explainers. He therefore started to think about doing the piece from a first-person perspective "and using interactivity as a way to allow the reader to engage further and get more background". One of the big challenges for Mann, Cole and the reporters involved was to distill the story and explain the key facts and to point people to where they could find out more. The multilayered approach to storytelling allowed them to do this. "The interactivity adds another layer," Mann said. "And that was really quite exciting because in news, and particularly in news video, we are normally condensing incredibly complex issues into very short periods of time. What interactivity allows us to do is to really expand on that and allow the viewer to expand on areas where they may need some extra background detail." So how was it created? "Most of the time went into the planning stage," Cole explained. "Neal and I worked with reporters in our DC bureau to really plan the script." Cole explained that the script, the first-person narrative, was key and getting it right took time. They also spent time finding suitable locations before filming – which was done using a headcam. 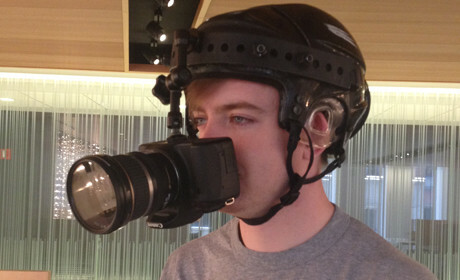 The headcam was an old hockey helmet with a DSLR camera mounted in front of the camera person's face. Cole, who wore the helmetcam for much of the filming, said they used a "cheap DSLR" and "about $40 worth of equipment to build the rig for the helmet". The WSJ team then worked with a company based in Belgium called Zentrick which added the interactivity. "We designed how the interactions would work, we scripted them and worked with a designer on our team to imagine what the look would be," Cole explained, "and then the company in Belgium spent a week building it for us before we rolled it out on our site." Mann and Cole said it was hard to judge how long they spent on the piece as they were both working on multiple projects at the time, but were keen to get across the ease at which other newsrooms could create such an interactive. Cole said reaction has been positive. "Looking at feedback and analytics to see how people are using this video we are finding they are interacting with it and we would certainly explore using this kind of interaction in future stories," he said. "For me the coolest part of this project was we built all of this based on the story we wanted to tell. We identified that the Affordable Care Act is often a broad, political story for most readers and viewers. So we wanted to bring it down to their level, use this helmetcam point-of-view perspective, along with interactivity which allowed us to do that in a better way. "For me it was really: prioritise your story, figure out how you tell that in the best possible way, and don't let technology or a fear of something new get in your way." Is this type of video something we can expect to see more of from the WSJ? "Looking to the future we want to tell stories differently," Mann said. "One of the reasons we approached this in the way we did was the traditional news format doesn't suit all the types of stories we have now, particularly when we have the internet at our disposal. And that's something we are going to continue to pursue to try to tell stories in a different and engaging way and ultimately to get the viewer to the end of a video and have them understand everything they've just seen." Mann also talked about plans to take the technology used in the video and roll it out across the WSJ and "so interactivity is something that becomes the norm". The Wall Street Journal has been creative in video: launching WSJ Live, an app and on-demand video platform, and WorldStream, an innovative experiment in social video, where reporters share behind-the-scenes footage of the newsgathering process. "Video is now a staple part of the Wall Street Journal's output and we do it across a variety of different platforms," Mann said. "It's a way for us to engage with the audience and for the audience to get a different view on our output." So where does this web-native style of film fit into the WSJ's other video offerings? "We are starting to look to the way in which we design video," Mann continued. "This for me is a key aspect of what we are trying to do. We need to redesign and rethink the way we produce video for the mobile and internet age. Traditional methods that we have used in the past are designed to broadcast into people's homes and now people are engaging with us on different platforms, on the go. We need to think about how we do that." "We are now working out how we can take videos, redesign them and get people to engage with them, share them, be able to watch them and get the most out of them on every different platform, no matter the size of the screen they are looking at." Announcement: Neal Mann will be talking about innovations in online video at news:rewired on 20 September. You can see a list of speakers here, the agenda here, and buy tickets here.